This Saturday Creetown and Newton Stewart play their Potts Cup first round tie that was postponed a couple of weeks ago. The teams played a rescheduled league match at Blairmount Park that resulted in a very close match with the Creesiders winning by a slender one goal margin on that occasion. There is nothing to suggest that this match will not be another close contest that could go either way, the winner having an away tie against Upper Annandale in round two. The Alba Cup Final between Mid Annandale and newcomers Bonnyton Thistle has now been postponed until Friday 27th October 2017. In the South of Scotland League league leaders Lochar Thistle play hosts to Threave Rovers and Lochmaben entertain Abbey Vale. Stranraer travel to Sanquhar to play Nithsdale Wanderers and will have to be at their very best if they want to take anything from a home side who are a tough nut to crack on their own park. St Cuthbert Wanderers should take the three points from their encounter against Dumfries YMCA at Kirkcudbright. Heston Rovers travel to Moffat to play Upper Annandale for another match that looks very evenly balanced and one that could well produce a draw and a share of the points. All South Clubs along with others all over Scotland are being encouraged to take part in the Show Racism Red Card Initiative that takes place this weekend with players participating prior to kick offs at all grounds in the area. 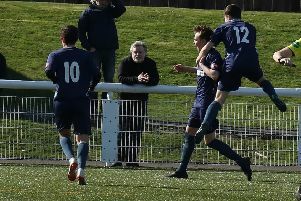 Last Saturday saw a mixture of South of Scotland League and League Cup matches being played. Annan Athletic entertained Newton Stewart at Galabank for a match the visitors were expected to take the three points from to maintain their challenging position at the top of the league table and that’s exactly what happened in a 4-1 victory for the Creesiders. The home side had the better of the early chances with Newtons defence standing firm but on the half hour mark they took the lead. Following this the home defence had to sustain some extreme pressure but conceded on the half time whistle when Marc Whyte headed an equaliser. The visitors introduced some substitutes in the second half and Johnny Fisher put his side ahead in the 69th minute with striker Robert Middleton scoring a third two minutes later. Latest signing youngster Robert Dargie added a fourth nine minutes before the final whistle with the visitors fielding three 16 year-olds at that point. Nithsdale Wanderers visited Dumfries to play YMCA and as expected returned to Sanquhar with the three points following another 4-1 victory. Upper Annandale played hosts to Bonnyton Thistle at Moffat and although David Shields scored for the home side the visitors took the points in a 2-1 victory that saw all three visiting teams taking full points.